The Stanley Park Nature House on Lost Lagoon has been twice flooded during this winter’s king tides and steady rains, but this has not stopped us from rolling out our newest exhibit. Many recent visitors will have noticed the incredible depiction of Stanley Park’s forest on the back wall inside the Nature House. This mural was only the beginning of a larger exhibit, one that celebrates the extensive restoration and conservation work that SPES coordinates in Stanley Park. This work is essential to maintain the ecological integrity and health of the Park’s ecosystems. Watch for this new exhibit to be unveiled on Earth Day, Saturday, April 23! Visit the new exhibit and learn about important, community-engaged projects such as upcycling invasive plants to support the restoration of damaged forest habitat. 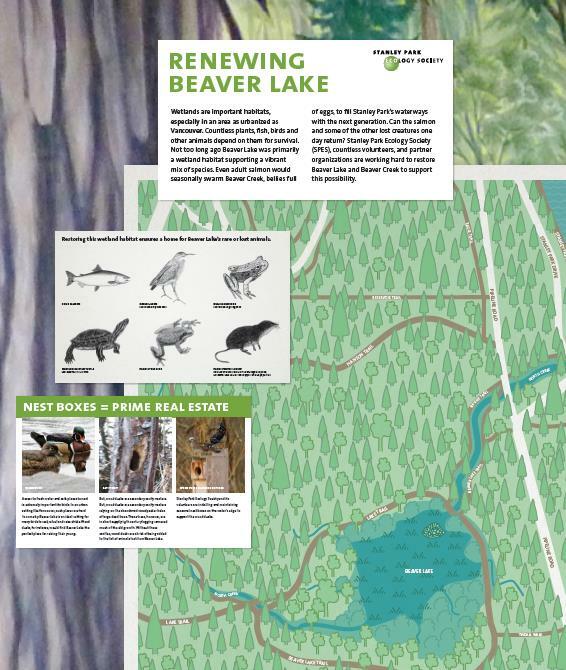 Drop by and be inspired by the diverse work rolling out at Beaver Lake that will support many different mammals, birds, fish, amphibians and insects that depend on access to fresh water in our city. Part of the Beaver Lake exhibit panel to be displayed in the new Nature House exhibit. 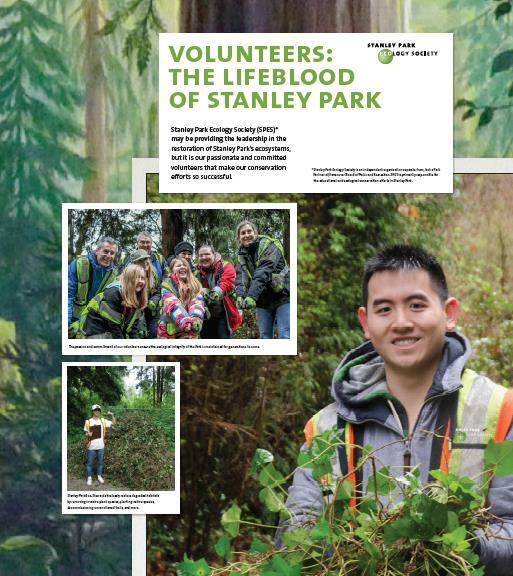 Check out the volunteer section of the exhibit and learn about the myriad ways to get involved with restoration and conservation efforts in Stanley Park. One of the new exhibit panels in the nature house. See you at the Nature House!